The dark, star-filled skies contrasting with the brightness of the surrounding towns is one of the qualities that make the Blackdown Hills AONB such a special place. According to a study by the Campaign to Protect Rural England (CPRE), the Blackdown Hills is the fifth darkest Area of Outstanding Natural Beauty (AONB) in England. 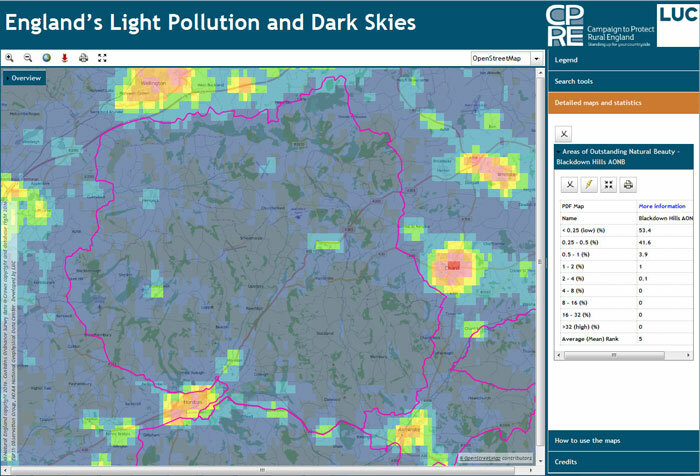 As part of its Night Blight project, CPRE has produced interactive online maps using satellite images of the night sky. These allow us to see the areas of star-filled darkness and the light pollution hot-spots throughout England. The Blackdown Hills AONB has very low levels of night-time brightness – 99% of its area has a radiance of less than 1 Nano Watt / cm2/ sr. 53.4% of the AONB is in the very darkest category (< 0.25 Nano Watts / cm2/ sr). Overall, the South West is the darkest English region, with the highest proportion of its area (67%) in the two darkest categories. More information is becoming available about the effect of light pollution on wildlife, interrupting natural rhythms including migration, reproduction and feeding patterns. Light spilling up into the night sky is also a waste of money and energy. It is sad fact that many children will grow up never seeing the Milky Way, our own galaxy. Blackdown Hills AONB supports measures to conserve and enhance dark skies; for example, encouraging people to consider the impact of artificial light in their plans for development. Whether you’re trying to minimise light emitting from your homes or business premises, you can get some useful advice in our Good Lighting Guide.